Modou Lo and Lac de Guier II Spark a Comeback for Senegalese Wrestling and Turn The World’s Attention to Senegal. 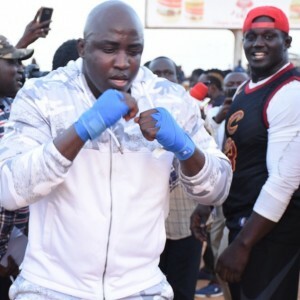 It’s hours before Modou Lo and Lac de Guier II's much-hyped fight; a combat of clarification which lit up Senegal and beyond garnering coverage from a number of international media outlets. Guediawaye and Parcelles, respective towns of the wrestlers, were adorned with gigantic flyers of the stars accompanied with ribbons tied from pillar to pillar. This is no ordinary fight. Such is the excitement glimmering the streets that any visitor could have mistaken the anticipated fight for an ongoing festival or charismas celebration instead, it was an event of intense preparation ahead of a big wrestling match held at the Stade Leopold Sedar Senghor - a multi-purpose stadium boasting a capacity of 60,000 located in the capital, Dakar. The wrestlers had previously squared up for the second time following a stalemate affair in their first meeting. 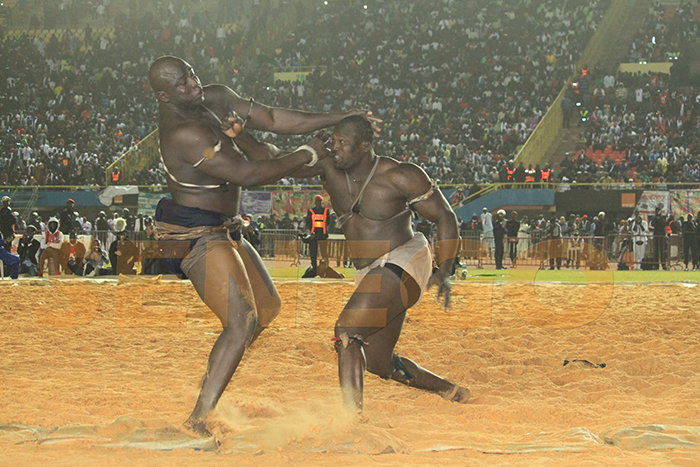 That contest was staged as part of events marking Senegal’s Independence Day Celebrations as thousands of wrestling mad-fans flocked to the venue, Stade Demba Diop, the West African country’s national wrestling arena. It didn’t end the way many had hoped with the referee declaring a draw after a fierce 20-minute fight. 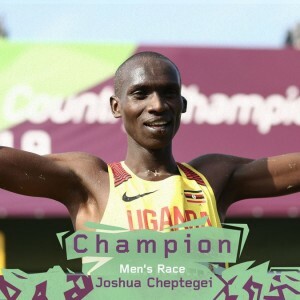 Both wrestlers came on the receiving end of criticism for ‘not fighting enough’ and were accused of boring the public and wasting monies of the 30,000 plus spectators who ‘braved’ the expensive entry tickets to watch the duel. Lac II –pictured left – in their first draw match six years ago: Source Leral. Six years on, a rematch finally took place on 28th January 2018, with the stars paid millions of CFA to make it happen. 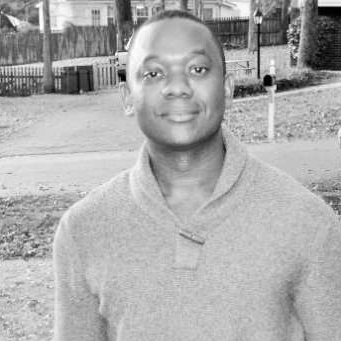 Modou Lo and Lac II both promised there wouldn’t be a repeat of what occurred in 2011. Modou Lo secured the bragging rights after being declared the winner on points against Lac II’s two warnings. Moving out of the arena amounts to a warning and point deduction –the equivalent of a yellow card in football language. Both wrestlers got a warning each for time-wasting and entering the circle late prior to the start of the match but Lac incurred a further two for going out of the arena twice. 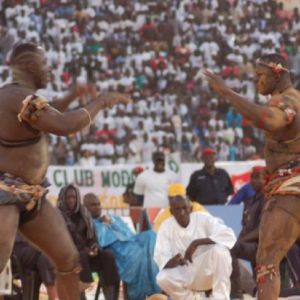 The second booking came when the Guediawaye man, under pressure from an all-punching Modou Lo, retreated out of the sacks as his opponent’s right-hander blow landed on his chest. The arbiter summoned him back amidst whistling from the sixty or so thousand fans across the stadium. The clash should have happened six months ago. The contract for the two to face-off was first signed in January 2017. It takes approximately four to six months for a combat to be staged from the day the agreement is first brokered. The clarification battle was initially planned for July 2017. All had looked smooth until an unfortunate incident occurred just twenty-four hours prior to the event. 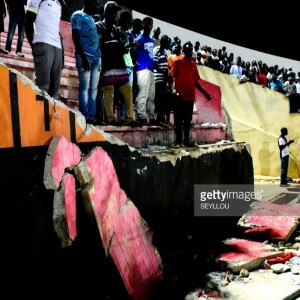 Two football teams were locking horns in a Cup Final game before pavilions of the Demba Diop collapsed after violence broke out among rival supporters. 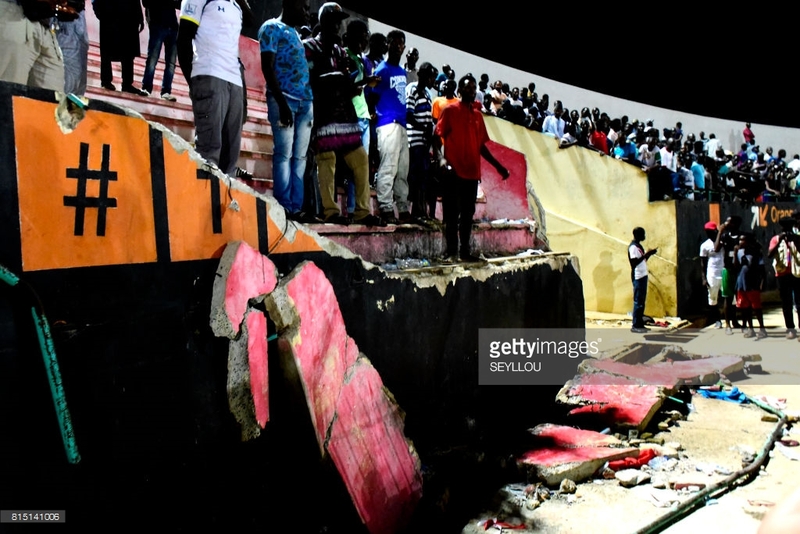 The stampede incident left at least eight people dead with several others wounded which left the Diop stadium by this time, no longer fit to host the wrestling contest. President Macky Sall declared a state of national moaning. Furthermore, the promoter had to succumb to losses spent on promoting the fight following the news that it would be rescheduled which in turn, affected other fights scheduled to follow. 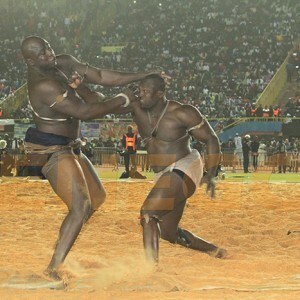 Demba Diop was the ideal setting to host fights but with talks that the ground was to undergo massive reconstruction, there was a serious crisis over where next to host wrestling duels. Stade Leopold was considered too large and Eba Mar Diop too small with promoters the least receptive to suggestions of organizing events elsewhere, on the brink of risking operational losses. Uncertainty loomed over doubts about whether the Modou Lo/Lac II fight would even take place amidst fears of the sport’s decline. 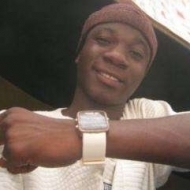 A fan’s death in July 2017 nearly brought back bad memories of the sport’s past when 27-year-old Khalifa Ndiaye was stabbed multiple times and robbed of 50,000 CFA by unknown assailants. But thanks to promoter Pape Galis’ resilience and leading by example to hold a match of huge eminence featuring Tapha Tine and Yekini Jr, he paved the way for other promoters to follow suit eventually making the Modou Lo- Lac II match a dream come true with a promo jingle running across TV channels in Senegal. It wasn’t uncommon for violence to mar the aftermath of combats years ago until recently when the central government took tougher measures warning wrestlers of possible sanctions over their fans’ misconduct. Both Lac and Lo condemned the act as an enemy of progress for the sport and followed with a cautionary call in a recent open press conference, appealing to fans to stay away from inciting violence ahead of Sunday’s must-watch showdown. 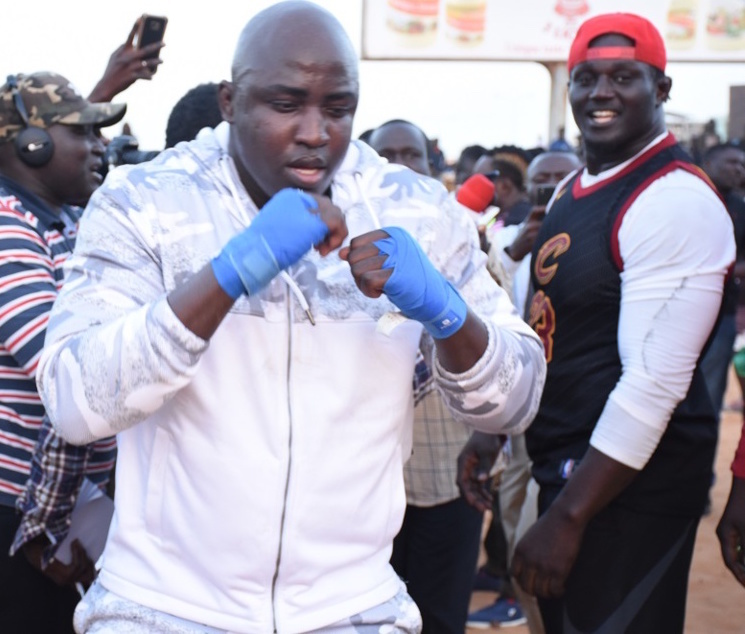 The incident occurred in Senegal’s administrative capital Dakar, hours after Modou Lo and Lac de Guier wrapped up a televised mandatory face-to-face pre-fight campaign. A fight broke out later between rival supporters of the wrestling stars. Modou Lo boasts of sixteen victories, two defeats, and a draw (16-2-1), a testament to how far he’s come up. An attack-minded wrestler, Lo, whose sobriquet is Kharange (meaning smart) has an attacking flair with possible better pace, as he has demonstrated in their last meeting. Good at launching blows from a distance as well as body shots, Modou is the epitome of a complete modern wrestler. 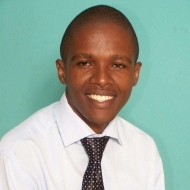 He does not disappoint in terms of free-styling and combating with his feet. Going into the fifteenth minute –five minutes from time – Lac II kept retracting, doing little to surge forward as he showed fatigue and appeared to have twisted his finger. Eumeu Sene and Gris Bordeaux have had a good taste of Lo’s capabilities after he thrashed both in recent campaigns. Lac II on the other hand, with twelve victories under his name, remains one of the most difficult opponents to face in the arena. He cut a lively figure in his open press conference also attended by childhood friend and fellow wrestler Balla Gaye II, former King of Arena. An overly defensive wrestler, Lac II has a laudable habit of securing victory even with a half-chance. Good at grappling and with a powerful favored left-hand, the Casamance-born is equally brilliant in freestyle fighting. 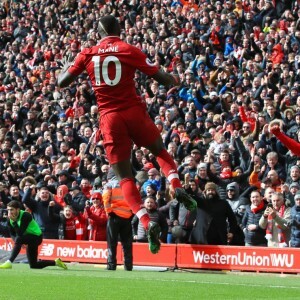 His closest and perhaps best chance in the recent bout came when he grabbed Modou Lo by the left leg and theatrically pushed him back but the Club Rock Energie starlet, Lo, wriggled out of it almost expertly, tucking his foot on Lac’s as the rambunctious crowd of spectators went ballistic in cheers. The arbiter by this time brought the clash to a close. 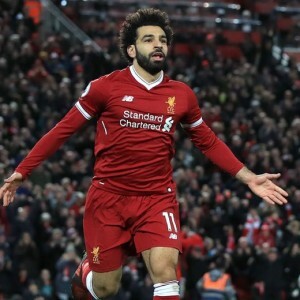 Though none of the stars wrestled the other to the ground, Modou was declared the winner on points after his adversary incurred three warnings (3-1). Modou Lo said in the aftermath of the contest. More Than a Wrestling Match. It was more than just a game for the two wrestlers and the towns they represented. Parcelles and Guediawaye have had an unpleasant past spanning back from the first fight between Balla Gaye II and Modou Lo, seven years ago. Lo and Gaye remain the sport’s highest earners to this day. The pair, Modou Lo from Parcelles and Balla from Guediawaye, locked horns in a combat that lasted less than a minute with latter emerging triumphant. The build-up to the fight and its aftermath was marred by unrest as the two towns literally declared war on one another. 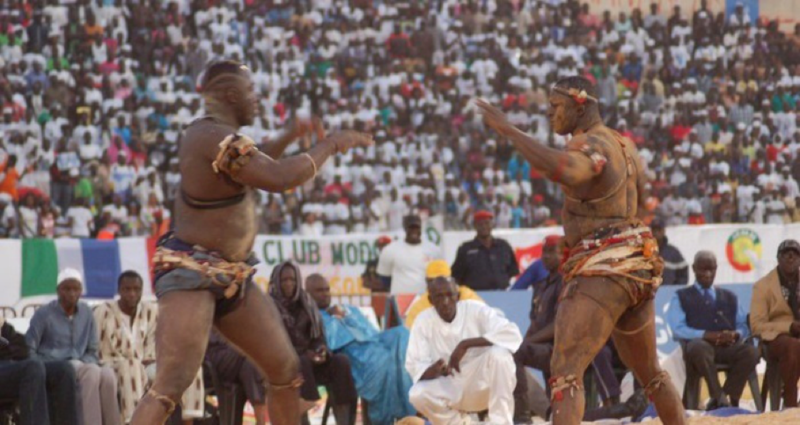 Series of violence broke out until then sitting President, Abdoulaye Wade called for the two wrestlers to sign a treaty in a move to defuse the escalating tensions among their fans. Disturbed by the scale of hatred between the two factions, Balla and Lo vowed never to fight no matter what sum they’re offered by promoters. No re-match has happened since but the animosity between Parcelles and Guediawaye remains. Lac II of Club Walo, born in Casamance -Senegal’s troubled north - but based in Guediawaye, is friends with Balla. As a result, there is a strong preference from Guediawaye to get one better of their rivals, tasking Lac II with the job. His stalemate with Lo left many Geudiwayeans irked making it all the more intriguing following Sunday’s encounter. Lac now has two career defeats with the first against Eumeu Sene, a man Modou Lo routed but made up for it by trouncing Yekini Snr, a mentor to Lo, who was forced into retirement having gone under the knife. Lac de Guier II being watched by Balla GayeII at his open training and press conference. Adding to match anxiety, Senegal is a country where soothsayers, mysticism, and marabouts command a huge following and are accorded the utmost significance as the head of state. 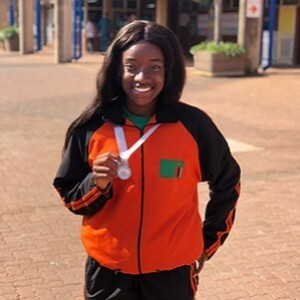 A soothsayer, Selbe Ndom got the public talking after she claimed that Modou Lo would be declared the winner of the fight. Coincidence or genuine? This is not the first time, however, that Selbe is making predictions in combats after she foretold the downfall of Balla Gaye in 2014 and Modou Lo against Bombardier, the subsequent year. She gained prominence and began to be consulted when she appeared to correctly predict the end of Wade’s regime in 2012. The bout opens doors for a possible combat between Lo and either Tapha Tine or Eumeu Sene – the latter whose close to $120,000 duel with King of Arena, Bombardier was canceled owing to poor management.